While many in the TV industry remain on the fence regarding the 3D TV 'revolution' it looks like the major telly manufacturers are all set to unveil new 3D TV product line-ups at CES early next month, with LG already announcing some ambitious targets for 3D in 2010. LG Electronics is the world's second-biggest TV brand by revenue, and wants to lead the emerging market in 3D televisions, going by its latest sales targets. 3D TV is clearly going to be the big news from the major TV brands at CES, with Samsung, LG, Sony Corp and Panasonic all putting their resources behind new 3D TV tech. LG wants to sell 400,000 3D TVs in 2010 (from a worldwide total of 25 million) and – wait for it - 3.4 million 3D TVs in 2011, the company announced this week. 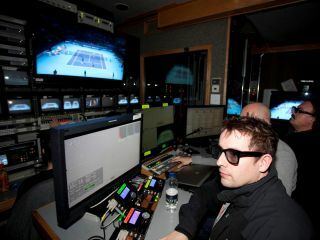 Its latest 3D TV models will be made available to consumers later in 2010. Currently the company only sells one very expensive 47-inch 3D TV, marketed to the business sector. "3D TV sales and 3D content will go hands in hands. Content providers will be reluctant to boost 3D production before certain number of 3D TVs are sold, and TVs won't sell well unless there's enough content available." Sony recently announced that it expects 3D TVs to account for up to 50 percent of its total TV shipments in the financial year April 2012 – March 2013. UK filmmakers and TV industry pundits alike recently gave TechRadar their warts-and-all thoughts about the manufacturer's rush to embrace 3D tech.